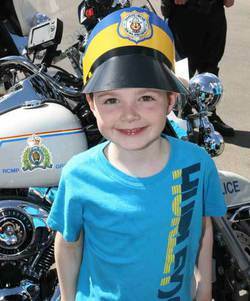 Six year old Samuel Rota proudly wears his "police cap" at the RCMP open house that took place on Saturday May 18th. The beginning of the long weekend got off to an extremely interesting start for many families in Leduc as they took advantage of an open house at the Leduc RCMP Detachment. As a kick-off for Crime Prevention Week, from 11-5 that day the RCMP and Leduc & District Victims Services joined forces to give the public an inside peek into some of the aspects of a police officers job. There were some very unique and specialized displays available for viewing that day which are not often seen in Leduc as they are not always needed here (thank heavens!). Set up on the grass out front of the station was their thermal imaging unit which had the side doors thrown open so people could step up into the vehicle and take a seat at the control desk, giving them a view of the computer screens showing various real time camera images. One of the screens showed a normal view taken of the immediate area surrounding the truck and tracking everyone milling around outside, and another screen showed the same shot but everything in it was a glowing thermal image. This technology is crucial in helping to find criminals trying to hide at night but can also be used to locate people who have become lost or trapped as well. One display everyone was anxious to see in action was the rollover simulator that was brought in from Edmonton for the day. Basically it is the cab of a truck mounted on a trailer and rigged to spin and simulate what happens to a person in a rollover accident. Life sized dummies are set behind the wheel and the anticipation of the crowd was considerably tempered when the machine was turned on and everyone saw exactly what can happen to a person if you are in a rollover and choose not to wear a seat belt. It was a very sobering moment for a lot of people. However, probably the biggest hit of the day was the Bomb Disposal Unit. The giant tactical truck was available to look through, a bomb suit which looked so heavy it's hard to imagine just wearing it let alone moving around and working in it was on display, but the most popular piece had to be the Bomb Disposal Robots. There were two different types of robots on hand which are used in different situations according to the need, but an officer was showing how the smaller unit was driven by remote control and demonstrated the actions of its pincher arm by having it grab and grip a pop can, much to the amusement of the large group of kids gathered around. Kids running around wearing their free cardboard "police caps" weren't the only ones living out their law enforcement fantasies for the day either! Grown men were anxious to get behind the wheel of Leduc's retro cruiser which is on active duty in Leduc County and is rigged up with all the computers, radar, safety gear, and bells and whistles that officers need on a daily basis. Two huge police motorcycles were on display as well as the RCMP's drag car which competes in races around Alberta. A bunch of officers were also on hand wearing several different styles of uniform, to chat with everyone and answer any and all questions people might have had. Tours of the detachment were also available for anyone who was interested in a behind-the-scenes look at police work, and Leduc & District Victims Services, the Leduc Nighthawks, the Family Violence Prevention Team, and Leduc's Drug Action Committee amongst others, had information tables set up inside with freebies for the kids to take home. 93.1 The One FM were on hand pumping out the tunes from their station vehicle and competing with the occasional siren blast from one of the emergency vehicles showing off their capabilities as families took advantage of the free hot dogs and pop to have a picnic on the grass in front of the station. Overall it was a fun and fascinating look at some of the different aspects of police work and a great way to kick off Crime Prevention Week in Leduc!